It was after work, and I was headed to Ahameedia’s for a cheese naan dinner. 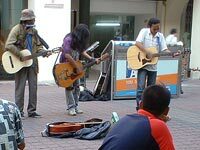 I was walking down Central Market and I noticed a quite complete band of buskers; one on the shaker, one percussionist, and three guitarists, most notably, the one in purple, mop-haired, with a Morris twelve-string guitar. They played All Along The Watchtower and Pink Floyd – Wish You Were Here. Coolness. This entry was posted in Music, Pictures, Travelling on August 4, 2004 by 2konbla. MEH! I did not talk about my [sucky] [ex] bfs. I actually refused to talk about the [sucky] [ex] bfs. And they weren’t sucky =P I just got dumped because I was. er. neurotic. ANYWAY. We were talking about ghosts la yesterday… you have bad memory la wei. makan abit more raisins k.
Hey, you’re a LOVABLY neurotic blogger mmmkay? Of course I left out bits about the ghosts. Nanti he say I bocor storyline, or the ending that I proposed. I even left out a paragraph on how older working dudes tend to belanja students like us. it was beside liquid mah… aiyor. and you don’t read signboards too well eh. So yes raisin-eating one, what was the name of the place? Darling, keep this Saturday free. It’s going to be at the Sunway College Field from 12-6. On time.